The internet is soon becoming a medium and tool for businesses to spread their presence around the globe. Business owners and promoters are using the internet in order to expand their hold on their respective market with the help of the internet. This phenomenon of business development through the internet is known as Internet Marketing. Experts in the industry through research and experience have developed a few key essentials which aide in the internet marketing process. There are 9 most important strategies that lead to successful internet marketing. These strategies include, content marketing, social media engagement, customer interest, personal branding, location based marketing, data analysis, graphics talk, video marketing and PPC and Ad re-marketing. An insight into the 9 secrets of Internet marketing, a better understanding of the strategies is achieved. Content marketing is one of the few indirect ways of marketing. Content marketing works on educating the prospective client base by supplying them with information by means of content, rather than actually selling a product. Providing information to the client in turn helps in earning their loyalty, making this a win win marketing strategy for clients as well as businesses. Social media engagement is the another way to keep prospects involved and along with that gain popularity for the marketed product. This strategy uses the social media attention of internet users in order to promote a product, service or idea. Driving or influencing customer interest is an effective channel to induce prospective clients to get converted to buyers or investors. Influencing customer interest is done by the means of blogs and articles that use information as a tool for marketing. Internet marketing is driven by personal branding, this is how one packages and showcases their brand on the web platform, it is all about creating an image on the internet that viewers will automatically connect with a particular brand or product. It is about creating a face or an identity for the business on the web. This is a method through which businesses may be able to offer their services to the prospective clients by identifying their location. This sort of a marketing strategy is carried out in collaboration with social websites that track the location of its users and subscribers. While using strategies to promote a business online, it is also important to keep a tab on which of the strategies are helping the most and what sort of clientele is most easily targeted, this is done through data analysis. With the help of data analysis, a business is able to grow better by remaining in sync with the marketing results and emphasizing on those strategies which are most beneficial for the business. Along with offering business services or products to clients, it is also important to keep them interested in the product range by way of using graphics. Graphics help in adding aesthetic value to your marketing strategies. Graphics talk large volumes and keep the clients engaged in a better manner than any other method. Video marketing is the next level of the graphic strategy. Creating and uploading unique video content ensures that the business provides an easy guidance to the prospective customer, where the buyer has to put minimum effort in order to gain information on the product. Ad re-marketing is one of the most commonly used method in internet marketing, this is done in combination with Pay Per Click (PPC). This method basically uses banner ads on other websites and the base business or website pays the ad hosting website a fixed sum of amount for every click on the ad that leads to the mother website. Ad re-marketing ensures that the banners shown to the prospective clients contain information about products that they have shown interest in while generally surfing the internet. 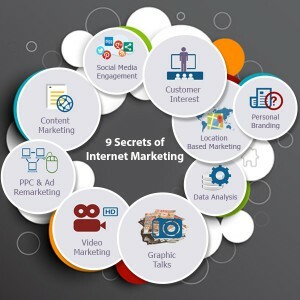 The 9 secrets of internet marketing are different ways to target internet users and to make sure that these users are converted to business prospects by subtly appearing the path of their internet surfing.